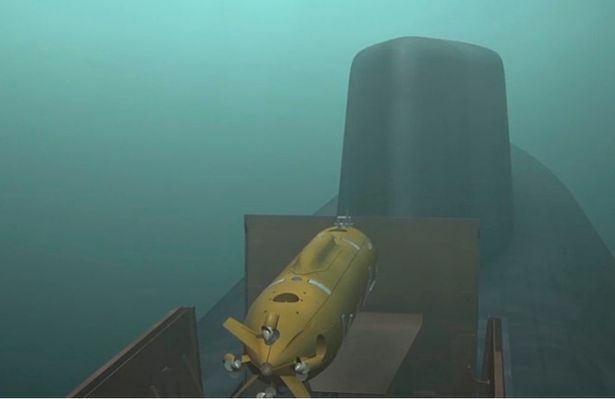 Vladimir Putin unveils underwater Poseidon drone that carries nuclear warheads ‘capable of causing 300 ft tsunamis’ – Coercion Code – "Dark Times are upon us"
A nuclear-powered underwater drone capable of destroying enemy naval bases and causing huge tsunamis is under construction in Russia, according to a state news agency. The Poseidon will be able to carry a nuclear warhead with a capacity of up to two megatonnes, a source told TASS. The drone will have a speed of 60-70 knots and will be operational at a depth of more than 1km. TASS has not been able to confirm the information. Rex Richardson, a physicist, told Business Insider: “A well-placed nuclear weapon of yield in the range 20 MT to 50 MT near a sea coast could certainly couple enough energy to equal the 2011 tsunami, and perhaps much more. The project of developing the Poseidon drone was unveiled by Russian President Vladimir Putin in his State of the Nation address to the Federal Assembly on March 1. The Russian leader said that these drones could be armed with both conventional and nuclear munitions and would be capable of destroying enemy infrastructure, carrier-led naval forces and other objectives. Russia’s president claimed the Poseidon will have “hardly any vulnerabilities” and said it would carry a “massive nuclear ordinance”. Russian Navy Commander-in-Chief Sergei Korolyov later said that the new weapon would enable the fleet to accomplish a broad range of missions in waters adjacent to the enemy territory. According to the chief naval commander, the trials of the drone’s basic element, the small-sized nuclear powerplant, have already been carried out. Poseidon drones together with their carriers make part of the so-called oceanic multipurpose system. The drone got its name following the results of open voting on the website of Russia’s Defense Ministry.